1. The M.P Tourism Development Corporation ( MPSTDC) accommodations near this park include rooms in log huts and a youth hostel at Kisli and rooms at the Safari Lodge at Mukki. 2. The officials of the park also provide accommodations at Khatia (20 double bed rooms), at accommodations at Kusli (7 double bed rooms) and accommodations at Mukki (4 double bed rooms). 3. 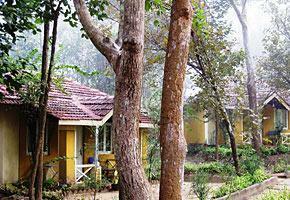 Nearby Tuli Tiger Resort: 18 rooms with 24hrs. room service; Swimming pool and in-house restaurant serves Indian and Continental cuisine; Resort also arranges for an open-air barbeque and tribal dance; Indoors pool table; Slide shows on wildlife; Jeep safari and tiger spotting on elephants at the National Park. Ph: Toll Free No. 1800 209 9050. 4. Wild Chalet Resort: Accommodation in cottages with modern amenities; In-house restaurant serves Indian, Chinese and Continental cuisine; Campfires at night; Jeep safari to the National Park. Tariff starts at Rs.2000/- (twin-sharing) for Indians / Rs.3100/- for foreigners. Tel: 07649 – 277205 /Telefax: 07649 – 277203. 5. Kanha Jungle Lodge: 18 rooms with twin beds and modern amenities; Spacious dining room with thatched roof serves Indian and Continental cuisine; Lodge can arrange for special theme dinners on request; Large library stocked with wildlife books and videos; Indoor games; Nature walks and visits to local fairs arranged on request. Special packages starting at Rs.8,500/- for 2 nights/3 days. Kanha National Park Mandla is not located in some remote area of Madhya Pradesh, but is easily accessible from various towns and cities. Mandla District, where the Park is located, does not have an airport. You need to board a plane flying to Nagpur Sonegaon Airport. From there, it is located 266kms away. The nearest major railway station to the National Park is the Jabalpur railway station, Madhya Pradesh. Alternately, you can take a train to Satna, which is about 130kms away, but does not have major tourist attractions like Jabalpur. At the Jabalpur railway station, there is a tourism office of the Madhya Pradesh State Tourism Development Corporation (MPSTDC), where you can arrange your trip to the Park and book accommodations. It is accessible by road from major towns and cities. You are allowed to drive your own vehicle inside the Park, but only petrol driven cars and jeeps are allowed. You also have the option to hire a taxi from Jabalpur or Nagpur to drive you to this place, hire a jeep for the excursion inside and then return by taxi. Maruti Gypsy vehicles are also available on hire at Khatia and Mukki to take you on an excursion to the Park. You can board a bus at the Jabalpur bus stand to the Park. There are regular buses plying between Jabalpur and the Park. Bus Timings from Jabalpur : 07.00a.m. and 11.00a.m. [please confirm before trip!] – this is of the Govt. bus which goes to the Park. Private bus services are also available. Geographically it is located in Mandla district, Madhya Pradesh. This place has a very interesting topographic location in a valley that resembles a horseshoe (considered a symbol of luck!). On each side are the forest covers of the Banjar and the Halon valleys. So the Park has got the best green carpets of both valleys! What's more, the waters of the Surpan River has created spots of water bodies throughout the wide expanse of the 1,940sq-km Park. This ensures that there is plentiful flora and a large number of birds, not to mention watering holes for the denizens of the Park. You can also contact the local Madhya Pradesh Tourism office Bhopal for up-to-date information. Exploring the Kanha National Park in Madhya Pradesh makes for a wonderful trip but, God forbid, you may need to contact the local officials in case of an emergency you should note down the below-mentioned phone numbers.